Well, the work necessary to complete my MSID degree is finished. I made my final presentation to faculty, fellow students and guest critics on Wednesday 5/8, and presented to a number of folks from industry on Thursday 5/9, all to favorable reviews. This means my project is “done” but I am, of course, looking for opportunities to develop this idea in the real world. I hope to have a final all-encompassing report/book finished in the next several weeks and I will post a link to that here when it is done. Please feel free to contact me via this blog with any comments or questions in the meantime. Feedback is most welcome. Many thanks to the people and organizations that assisted me in this effort, particularly the Children’s Hospital of Philadelphia. A list of advisors – most likely incomplete – can be found on the final page of the slide deck. Since my broader Master’s project had me looking at the otoscope from a systems integration point of view, I chose that device for an ergonomics independent study to fulfill one of my other graduation requirements. Here are some photos I took of the user testing I did at Children’s Hospital of Philadelphia. We’ve got user testing scheduled soon, so we are working on the interactive prototype at NextFab Studio over spring break. Designers call this kind of prototype (testing function, not yet concerned with appearance) a “big ugly” so the critics then can not say “it’s too big” or “it’s ugly,” and the testing/critique can instead focus on the functionality. Startup Weekend Health Philadelphia ran from Friday 2/15 through Sunday 2/17 and it was an awesome experience. We learned that pre-formed teams have a harder time attracting new members than teams formed on the spot, but decided to work on our project through the weekend anyway rather than split to join other teams. That was a good idea. Not only did we have a dedicated block of time in a great space to focus on the project, but I estimate we had about eight great conversations that could have taken us weeks or months to organize individually. The need to repeatedly describe the project to every new person we met – plus the initial and final presentations to the group – really honed our rocket pitch. Here’s a link to our slide deck for the final presentation. Thanks to team members Michael Cabus and Eileen Francisco for all their hard work. As an “infographic”, it has a lot of text and the actual graphics don’t aid understanding as much as they could. But I think it does tell some important points, and I think the fact that it was made – or needed to be made – is telling in its own right. 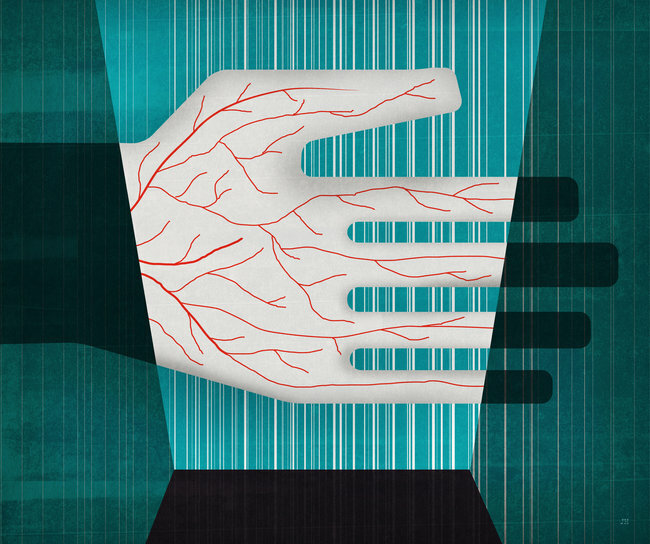 I am investigating the use of biometrics for both clinician login and patient verification as part of my EMR-related Master’s project, so it was interesting to see this cautionary article in the New York Times. As design students, we are trained to recognize problems in our designs and address them rather than let them deter us from our end goal. So I do not want to dismiss the concerns expressed in the article, but better definition of the specific risks involved would be needed before they could be mitigated. Unfortunately, comments are not enabled for that article, so such discussion is not possible there. I welcome any civil arguments, pro or con, to be shared here. My name is Don Pancoe, and I am an electrical engineer of 20+ years who is now in the 2nd year of the MS Industrial Design program at Philadelphia University. This blog is my place to post work, receive feedback and have conversations related to my Master’s project. I began investigating EMR user interface issues as part of a related project (and here and here) in my first semester (Fall 2011). At that time, I had identified the “low-hanging fruit” opportunities of redesigning instruments to automatically capture data and images into the patient’s electronic record, thereby eliminating manual data-entry steps that can be quite disruptive to the exam. I also looked at ideas for quickly displaying current readings in context with historical data to aid the clinician in conveying important issues to the patient. Revisiting the topic for my full-year Master’s project, I am looking for broader opportunities for improvement. For example, I’m looking at the overall EMR ecosystem, both present and future, in which my designs must exist. I am also looking at my designs in the context of exam workflow to see if they can be revised to better fit that workflow, or even if there are cases where the workflow itself should be reexamined. I have come to realize that my original ideas for automated data capture and charting, while improving efficiency, could also promote a “source-based” approach as opposed to one that is “problem-based” (borrowing terminology from Dr. Lawrence Weed). To this end, I definitely want to incorporate the idea of SOAP notes into my design, but in the interest of limiting keyboard-and-mouse interaction, I am looking into voice recognition technology as an option. I will continue to post here as the project progresses (due to complete by May 2013), and as new questions and discussion topics arise.